After an horrendous first half spell, Australia recovered to produce one of their all time greatest performances at the World Cup as they pushed late for a deserved point against Chile. The South American side raced into a 2-0 lead within 15 minutes, threatening a cricket score before Tim Cahill rose to head Australia back into it before half-time. A thoroughly one sided performance in the second half didn’t pay dividends for the Australians who conceded late on to cruelly lose 3-1 to a dynamic Chilean squad. The team lineups were as expected, with Postecoglou keeping the same defensive set up as they did against Croatia, set up to counter against the more technically gifted opposition. Mark Bresciano came into the side in an attacking midfield role as Tommy Oar returned to his usual left wing berth. Chile named Arturo Vidal in their starting lineup despite injury concerns surrounding their influential playmaker. The match started conservatively, Australia immediately making the most of Chile’s expansive game, playing long balls in behind their rampaging full backs for Tommy Oar and Matthew Leckie to run on to, and pushing back Chile’s midfield anchors also. Their own full backs started deep but a clear 4-2-3-1 shunted across the pitch in unison with impressive organisation, Tim Cahill in his lone front role in sole charge of closing down Chile’s centre halves. 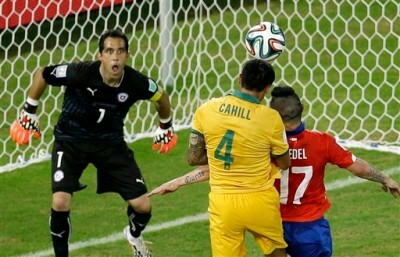 Shortly after, panic ensued and Australia felt the full force of Chile’s attack. Neat interplay played them in behind the back four leading to chaos in the centre, Aranquiz’s quick thinking tempting out keeper Mat Ryan before setting up Alexis Sánchez, who tore through Australia’s defence and lead to open the scoring with some style. Defenders spread across the area with little structure provided some warning signs which weren’t heeded. Minutes later a diagonal cross run from Vargas pulled Franjic out of position alongside CB Wilkinson leaving Valdivia free to double Chile’s tally within minutes of taking the lead. Australia were dumbstruck, fearful and disorganised, something that needed to be sorted out immediately if Chile weren’t going to run riot. Postecoglou’s first competitive fixture was threatening to turn into an embarrassment, order needed to be instilled even for a brief period, Australia needed to keep the ball from Chile. And that they did, after some toing and froing, Australia found some identity, found some backbone, found some belief. Leckie continued to run the channels, committing defenders to challenges, forcing them into mistakes, eventually culminating in the Aussie goal. After a Bravo mistake early in the move, Franjic finally made a move forward to deliver brilliantly for Cahill to head home, not only a consolation but a way back into it for the Australians. With one towering header Australia had turned around the stadium, the neutral was cheering on the underdog. The second half continued the upbeat surge from the Australians. Speed from Leckie kept the Chileans guessing, Davidson continued to bomb down the left, while Cahill was a constant threat in the air going close twice before having a goal correctly chalked off after a narrow offside call. Australia’s progress and ultimate result was diminished considerably when Ivan Franjic pulled up with a worrying left thigh injury. His replacement McGowan adapted to the game well, but stayed at home more often than not as Davidson made his strides down the left. Further attacking changes were made in hope of an equaliser with Halloran and Troisi brought on to provide younger legs, but the key threat continued to be via Cahill’s head. The final push didn’t force an equaliser in time, Chile countered with a rare but deadly second half attack, finally finished off by substitute Jean Beausejour who ended the match as a contest and sent the bench into delirium after holding out for the whole second half. A scene of dejection, players pulling up with cramp but ultimately a proud display from the Australians was there for all to see. Going into the match, many considered Chile as the neutrals favourite, but 90 minutes later Australia were the nation gaining the plaudits for their brave and well organised display. Postecoglou’s aims at the start of his reign were based around next year’s Asian Cup, but clear outlines were set for the World Cup. A brief to make the country proud was a minimum target, one that has been defiantly achieved this evening. More than that Postecoglou’s side showed technical and tactical nous alongside some dazzling individual performances, they can hold their heads high and realistically prepare to compete against the Netherlands and Spain in the coming weeks. Maty Ryan – 3/5 – Decent display for much of the game but still looks a little too keen to rush off his line. Ivan Franjic – 3/5 – Started slowly and got sucked in for Chile’s second. Assisted Cahill’s goal but limped off prematurely. Alex Wilkinson – 4/5 – Continues to grow as a Socceroo international. Strong and disciplined display. Matthew Spiranovic – 3/5 – Nervous spells but had a comfortable second half alongside Wilkinson. Jason Davidson – 4/5 – Tireless performance down the left, creating numerous chances. Monitored Sánchez excellently. Mile Jedinak – 3/5 – Aggressive throughout but got caught flat footed occasionally. Mark Milligan – 2/5 – Passed by for much of the game but kept running the whole 90 minutes. Matthew Leckie – 5/5 – Star performer on the night. Fast runner who struck fear into Chile’s defence, but also covered well. Mark Bresciano – 3/5 – Slow first half but more direct in the second. Could have scored from two good chances. Tommy Oar – 2/5 – Looked energetic but failed to get on the ball after the first few minutes. Tim Cahill – 4/5 – Great target man who was a strong threat in the air, scoring the only goal. Continues to bully the opposition. Ryan McGowan – 3/5 – Looked at home in an unfamiliar position. Lacked the attacking flair of Franjic. Ben Halloran – 3/5 – Similar to previous cameos. Energetic but lacked final product. James Troisi – 3/5 – 10 minute appearance, passed it well in the final push.